August 8, 2013 • Exploration and Discovery, Science, Who Knew? …that in 1744 Thomas Clap, Rector and Yale College president for 26 years (1740-1766), constructed the first orrery, or planetarium, in the American colonies. Clap transformed Yale’s curriculum, ushering in an age of mathematics and science with a particular focus on physics and astronomy. Essential to astronomical instruction, the orrery was a mechanical model of the solar system that could be used to illustrate the known major celestial bodies with their relative sizes and positions. The machine was seven feet in diameter with components held in place by pins and wires. Large metal plates represented the sun, moon, and planets. While primitive compared to the instructional tools used by European institutions of the time, Clap’s model did allow students the ability to see the complex movements of each of the planets, visualize eclipses, and trace the path of comets. 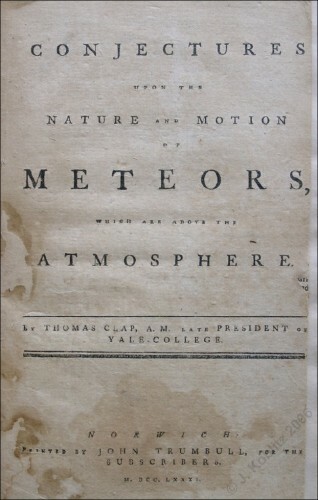 Thomas Clap’s theory, which suggested that meteors were comets that orbited the earth, was published posthumously in 1781 as Conjectures upon the Nature and Motion of Meteors, which are above the Atmosphere. Powder Hollow in Hazardville – Who Knew?